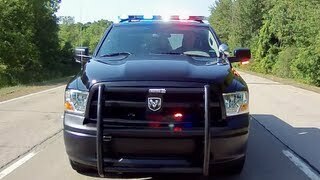 Getting chased by Ram Special Services Police truck will definitely be the worst experience for any criminal. Chrysler’s have added new name in their growing portfolio. 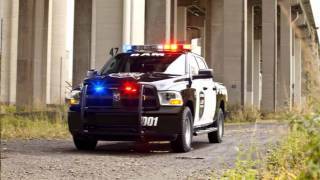 After gaining huge accolades for Dodge Charger Pursuit, they are back with more features in their new Special Services Police Truck. Let us see what more it has in its branches and stems to serve the administration and security services. 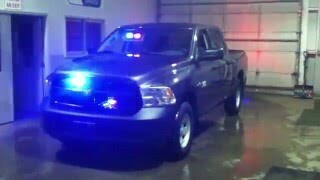 The Dodge Ram 1500 Special Police Truck has been prepared to work thorough in handling the severe demands of Law Enforcement. It has been engineered to handle the high electric loads and for same it holds 220-amp alternator. The integrated wire harness is very well capable of availing power for lighting, siren, computer, modem, radar or camera systems. IN this very same package also comes the Power Distribution center with fusing and relays for circuits contained in wire harness. The Power Distribution Center holds two separate wires of 100- amp main fuses for camera, computer, modem and printer systems. The instrument Panel has a certified speedometer carrying engine hour and idle hour meter and a 110-volt inverter. The four key fobs and ten-way power front seats, with blink accommodate multiple drivers. 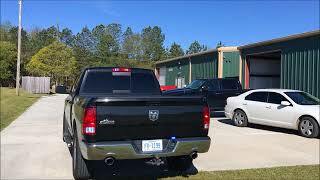 The Dodge Ram truck 2012 holds a special headliner with auxiliary dome lamps headed over cloth bucket seats in first row while in second row over vinyl bleach. For this model company has removed the center console to add some more space for extra equipments and also located the shifter on steering column. The interior volume of the roomy crew cab is configured with 126 cubic feet and additional welds have been done in the in the front door structure to take care of the Ballistic materials weight. For those who are aware about the security vehicles and in particular from this company, the RamBox has also been added measuring 50.5 inches offering 7.3 cubic feet of lockable storage. Wheel are made of steel and are wrapped with Goodyear LT265/70R17 tires accompanied by ABS equipped front and rear disc brakes. As for the suspension keeping in mind the undefined terrain, company has used the coil-spring rear suspension. This particular innovative suspension form provides best in class ride and handling both irrespective of the terrain you are chasing. 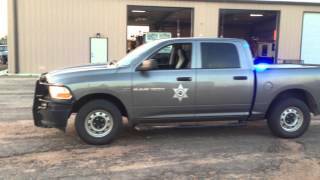 Talking about price of Dodge Ram 1500 Police truck 2012, it hardly matters as to ride it you need a badge and if you have a badge, the authorities will definitely provide you one to provide services in maintaining a crime free, secure city.